Parasitic plants are important parts of many ecosystems due to the wide range of organisms they interact with. While they can be detrimental to the host plant's growth and reproduction, they are also a food source for many animals. For most parasitic plants very little is known about their basic natural history, let alone the impact they have on the surrounding environment. In the paper featured in this post, a group of researchers conducted a study to collect some much-needed basic natural history information on a common but poorly known parasitic plant call Langsdorffia hypogaea at the Panga Ecological Station, a cerrado reserve located 30 km south of Uberlândia in southeastern Brazil. Langsdorffia hypogaea is a widespread parasitic plant found in Central and South America. It has been recorded to parasitise at least 23 different plant species, ranging from lianas, trees, and even a species of cactus. In this study, the researchers found it parasitising five different plant species at the cerrado reserve, with Miconia albicans, also known as Canela de velho, being the most commonly used host plant. It is not easy to spot the parasite's presence - it spends most of its life hidden underground as a parasitic tuber attached to its host's roots, and the parasitised plants do not look visibly different from its non-parasitised cousins. Unlike hemiparasitic plants such as mistletoes which have leaves and are able to photosynthesis on their own, holoparasitic plants, such L. hypogaea, are wholly dependent upon their host and do not have much in the way of external structures. The only parts of L. hypogaea that poke out of the ground are its red, mushroom-like flowers, which only appear during the dry seasons. So even though it is fairly common, unless you know what to look for, you won't even know that it is there. This is probably why very little is known about it aside from description of its anatomy and the list of plants that it parasitises. Until this and similar studies came along, the most comprehensive research on the natural history of L. hypogaea was published over a century ago. Since even though it is a parasite, L. hypogaea is still a flowering plant - so what pollinates it? In New Zealand, an endangered species of parasitic plant called the wood rose (Dactylanthus taylorii) is pollinated by short-tailed bats. In this study, the research team found that the mushroom-shaped flowers of L. hypogaea were visited by a variety of insects ranging from ants, to wasps, to cockroaches. Unlike the wood rose, which produces a prodigious amount of concentrated nectar, L. hypogaea skims on the sugar and secretes a relatively dilute nectar. It is enough to attract many insects, but those insects might not be the plant's main pollinators. Judging from the flower's structure, the research team proposed that the main pollinators of L. hypogaea are more likely to be larger animals like small mammals or birds. To find out what pollinates L. hypohaea, the researchers set up infrared-based camera traps near its flowers, and the resulting footage revealed a surprising nocturnal visitor - the white-naped jay (Cyanocorax cyanopogon). Aside from insects, those birds were the only animals seen to visit the flowers of this parasitic plant. At this point, it is not known how important the white-naped jays are as pollinators comparing with all the other animals that visit the flowers of L. hypogaea. Indeed, there is still much which are unknown about this parasitic plant, such as how its seeds are distributed, how it infects the hosts, what effects it might have on their host, and the kind of interactions it might have with the rest of the organisms in the ecosystem. Organisms which are not well-studied, especially parasites, are not necessarily rare or exotic - they can be fairly common, but because they are hidden out of sight and they are also not on our mind. But to overlook parasitic plants such as L. hypogaeae is to ignore some of nature's most intimate connections and the impact they have on the nature world. Santos, J. C., Nascimento, A. R. T., Marzinek, J., Leiner, N., & Oliveira, P. E. (2017). 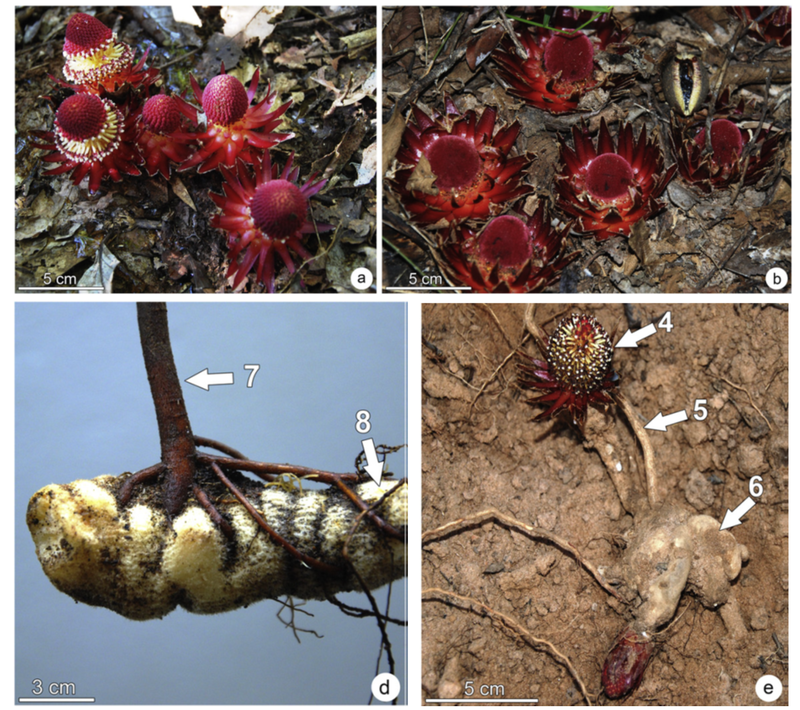 Distribution, host plants and floral biology of the root holoparasite Langsdorffia hypogaea in the Brazilian savanna. Flora-Morphology, Distribution, Functional Ecology of Plants 226: 65-71.